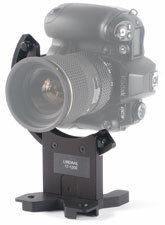 Designed specifically for use with digital SLR cameras, the modular Lindahl system starts with a Rotating Camera Bracket. 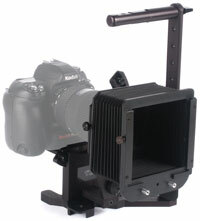 Adding the optional Flash Bracket keeps the strobe centered above the lens for vertical and horizontal composition. 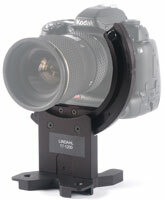 To complete the system, a lens shade may be added to prevent lens flare and allow the use of many Lindahl filters and vignettes. Each component of the system improves the functionality and performance of your digital SLR, along with enhancing the professional look that sets you apart. The Digital Camera Bracket allows smooth, quick rotation from vertical to horizontal while keeping the lens centered. This lightweight bracket can be hand held or mounted on a tripod. Camera specific mounts must be ordered separately, with models available for most professional digital SLR cameras. 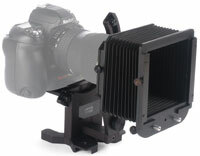 The optional Flash Bracket keeps the strobe centered over the lens. 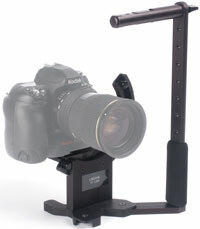 Incorporating a padded handle, it can be mounted on the left or right side of the camera bracket. It comes equipped to accommodate strobes with 1/4-20 thread size, or it can be used with various Lindahl strobe mount accessories. Even when shooting digital, a shade is needed to prevent lens flare. An adapter disk (ordered separately) couples the lens to the Lens Shade, allowing the camera and lens to rotate while the shade remains upright. This system also accepts standard Lindahl 3" filters and 4.5" vignette slot devices. A metal Adapter Disk is attached to the lens filter thread, which is used to couple the lens to the lens shade. A camera specific mount keeps the lens on axis when rotating from vertical to horizontal. Camera mounts are available for Canon EOS-20D, 30D, 40D; Nikon D70, D80, D200, D300 ; Fuji S3 and S5. Camera mounts are not included with the rotating camera bracket, and must be ordered separately. Consult your local dealer for information on current models.